Dentistry @ Its Finest (Costa Mesa) - Book Appointment Online! Dr Michael Ayzin believes that there are three key elements that come together to make Dentistry @ Its Finest: 1. High ethical standards 2. Use of the latest and best techniques and technology 3. Concern for patients, not just during treatment, but afterwards as well Since he began practicing dentistry, these have been the cornerstones of Dr Ayzin's approach to patient care. His many satisfied patients are a testimony to the effectiveness of his way of working. 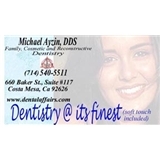 Dr. Ayzin is a very experienced, knowledgeable dentist who has turned his profession into an art form. After having quite a lot of work done by Dr. Ayzin, I can say that the results are wonderful. My treatment plan was carefully explained to me, and my input was taken into consideration at every step. Dr. Ayzin's practical and aesthetic judgment regarding my care was right on target, and although he did not force his opinions on me, I am so glad that I listened to his advice--my teeth look and feel great! The office is well-staffed, appointments happen on time, and the fees are reasonable. Thank you, Dr. Ayzin!